In organisations today, email is one of the most significant risk factors. This is not because of email itself, but risk comes from how it is managed. Some key factors to consider on the topic of email management are the avoidance of ransomware, phishing scams and data loss incidents. One must also consider how to ensure that email systems are an effective communication tool that helps people to do their jobs. Another side of email management is the sheer quantity of it. Many individuals receive so many emails daily that they struggle to keep track of it. During this half-day course you will learn to view email as a tool to enhance communication rather than a tool for the management of documents. In addition, you will learn practical tips and tricks that can be instantly used in the workplace to make your email work for you. During the course, you will take in learning during presentations, take part in Q&A sessions, participate in group work and explore real life case studies. As with all WuDo courses, students will have access to course and assessment materials on the WuDo Moodle, and the opportunity to ask follow up questions and access additional materials after completion of the course. 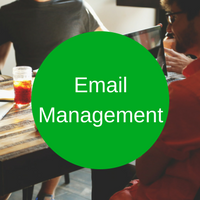 Fill out your details to find out more about Email Management.